"Taking into account para's 2, 3 and 4, plus no other UFO activity being reported throughout the UK, I suggest that the individual in question probably witnessed the arrival or departure of the helo's at Aldergrove," read part of the relevant response." 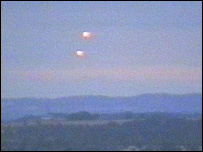 Another file revealed that a passenger jet bound for Heathrow Airport had a near miss with a UFO. It tells of how the captain of the Alitalia airliner shouted "look out" to his co-pilot at the sight of a brown missile-shaped object shooting past them overhead. This is the second instalment of UFO releases to The National Archives by the MoD.